I only worked in manufacturing industry for a few years starting in 1975 and tailing out in the early 1980s. Apart from this, the bulk of my working life has been spent in University research and teaching. Yet that short spell in industry was a very significant one for me. It taught me many things that helped me in later life and which I probably would never have learned at University. In particular, it taught me to focus on delivering what I’d set out to do, on time and on budget. In addition, having worked for a small firm during the 1970s I can clearly recall how different that actually was to the image we get painted nowdays telling us that it was a decade of “strikes and unrest”. That’s certainly not what I experienced! Nor what I saw of other small or medium sized enterprises. Some very large businesses did have problems with strikes, etc, but they didn’t represent the bulk of smaller firms or the many people who worked in them. Curiously, my brief time with Armstrong means that I’m now probably far better known for what I did during those years, and for my continuing interest in Hi-Fi, than for any of my academic work. This seems to have continued to be the case as an interest in ‘classic’ Hi-Fi has grown! So this webpage is largely about events outside my University work. In addition to Armstrong there was also one particular incident in my home life in 1977 which I’ll include because it helps shine some light on where I lived and the people there. This was the Queen’s “Silver Jubilee”. 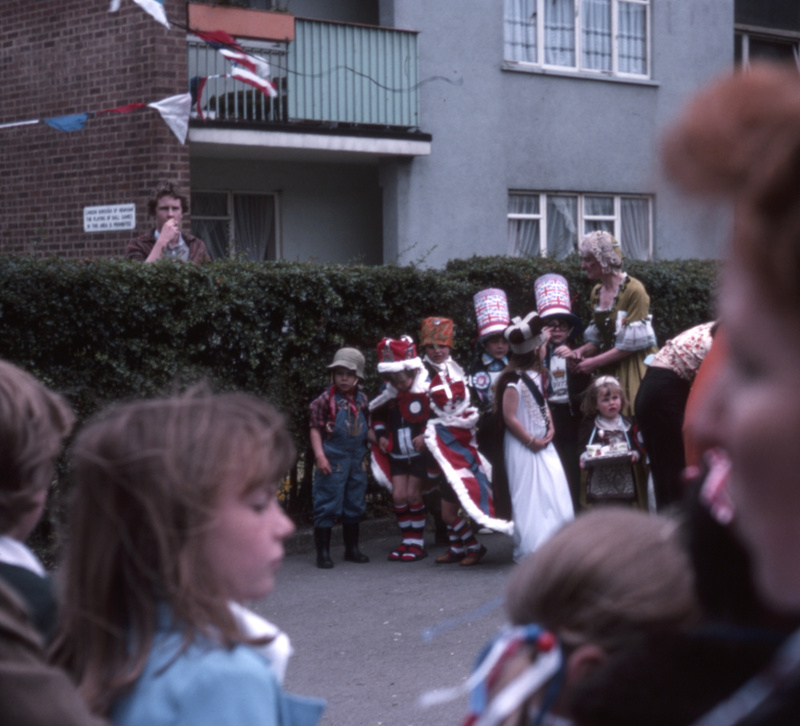 The people who lived in our blocks of Council flats decided to organise a children’s fancy dress street party to celebrate the Jubilee. This event is now a reminder to me that the people in the flats were a community who knew and helped each other. A minor example of this was that until we could afford a telephone of our own one family who had a flat on the story above us would allow us to use their phone. And in fact, we had moved into that block of flats because my Mother’s parents were already housed in one of them. When we were moved out of Western St a flat was vacant, and we were given that to be near her parents. 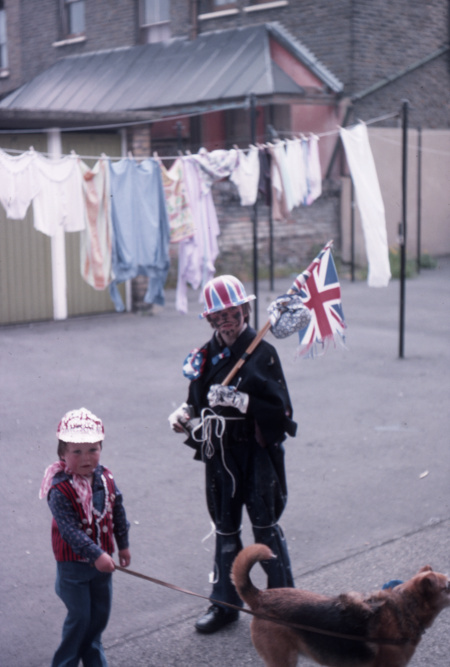 The photo on the left is an example of the patriotic fancy dress the parents produced for the party. This photo was taken in the communal area behind our flats where people put out washing to dry. Each flat also had a small ‘shed’ allocated to them on the far side of the area. 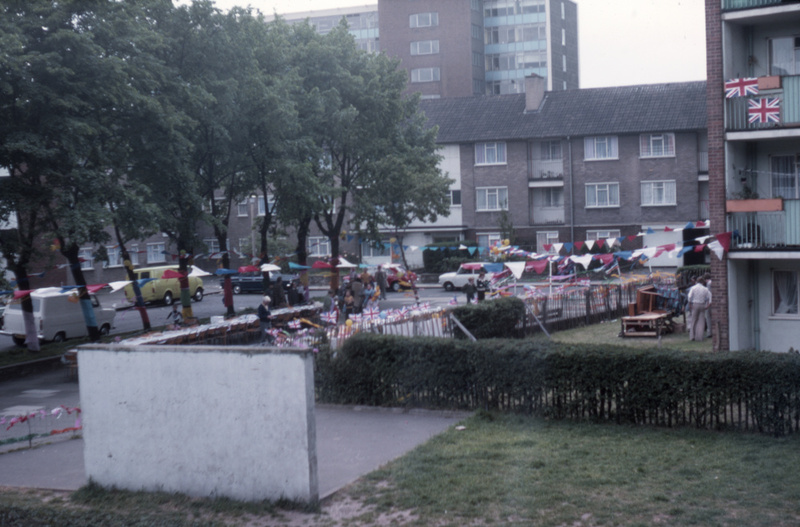 In this case, the term ‘street party’ is slightly misleading because the community was housed in a set of low rise ‘maisonettes’ around three sides of a square with a tower block at the center. 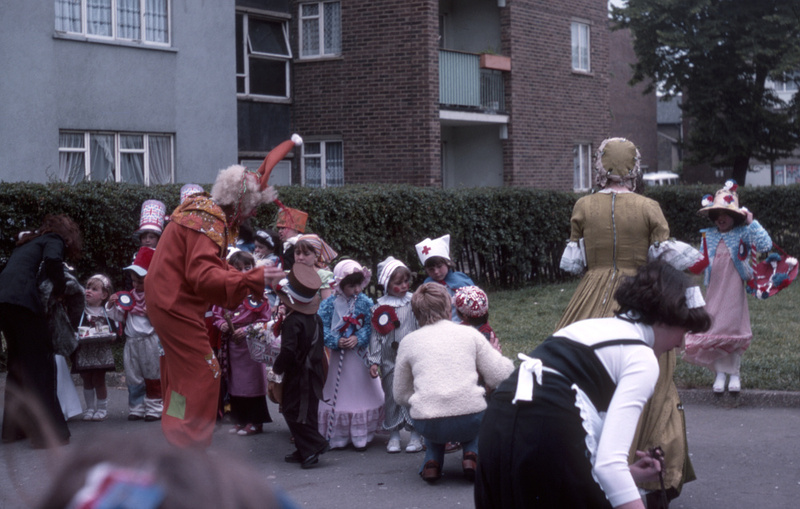 However the residents organised a party in the square complete with food, children’s games, and fancy dress. By then I had a camera, so took photos which I think now show both what the location looked like and the spirit of the people. The photos also make a counterpoint to discussing Hi-Fi!. My PhD studentship at QMC had ended in 1975. I didn’t bother to try writing up a thesis and submitting it. The main reason for this was that I’d simply spent the time learning and enjoying the process. I’d been on a number of observing trips and learned a great deal about electronics, instrumentation, etc. But I’d not kept detailed notes on the work I had done, and it was a series of different projects, not an in-depth study of one specific topic. The supervision I’d had wasn’t, to be honest, very good in terms of ensuring I organised what I did with a PhD in mind. But in fairness, I was simply enjoying moving from one interesting project to another without being too concerned about that. Towards the end of the studentship my supervisor, John Bastin, did try to get me to write a PhD thesis on ‘sky noise’. This is the way thermal radiation and absorption fluctuations in the atmosphere add unwanted random noise to infra-red astronomical observations and attenuate the wanted signal. I had done some work on measuring these problems, but felt I simply didn’t have enough to write up for a PhD. So I left without writing a thesis. Photo showing the square with the Jubilee party tables, bunting, etc laid out. The photo was taken from the balcony of our first-floor flat. QMC had a careers officer who I met and he arranged a job for me with a defence firm called Hawker Siddeley Dynamics at a factory they had near St Albans. That seemed like a decent way to continue with my interest in instrumentation, etc. However when I got there it was a real disappointment. The main problem was that they had no work for me to do! At that time a lot of Government defence contracts were handed out on what was called a ‘cost plus’ basis. i.e. the company got paid an amount that added an agreed percentage of profit on top of what had been assessed as being the actual costs of doing the work. This had become the standard way of funding defence work by commercial companies. In a research situation this does make some sense because it can be hard in advance to correctly determine everything that is required. Unpredictable problems may crop up that then need extra money and effort to deal with. However the downside is obvious. A commercial company becomes tempted to over-estimate the costs in order to boost their profits as well as avoid any later difficulties with problems. It soon became clear I was there because I, and others, brought in added profit for the company even though we didn’t have anything to do. Indeed, when I asked if I could experiment and try building and testing things that might be useful I was told, no. That would mean I’d be using resistors, solder, etc, which all cost money. So I was told to sit and read or go to the library. This seemed to suit some people there, but I felt it would mean I’d get bored and start to lose any skills I had gained though lack of practice. Hence after a few weeks I said that I’d leave if no useful work could be found for me. My only other recollections of being there were that I was with many other people in a large hanger. When a radar outside was tested this used to light up the fluorescent tubes on the ceiling, and swept a band of lit tubes across it during each scan! Quite dramatic. I also recall that each day someone would blow a whistle and people would then line up along a gangway. This was to get change for the vending machines that sold drinks and sandwiches. As a result many people stopped any work for over half an hour each day as they queued up, got change, then lined up to use the machines to get food and drink. I can’t help suspecting it would have been more efficient for someone to come around with a trolley! However, after a month or two, I quit. What followed was actually the only time in my adult life when I was unemployed for very long. At other times I was lucky and essentially stepped from one job to another with essentially no break. Having been unimpressed with the careers officer I decided to DIY my own attempts to get a job. Thinking about it I decided that I was mainly interested in academic work, research, and... hifi. I saw an advert for the Patent Office (then based in London) and applied to them. I also sent letters to two UK Hi-Fi companies – QUAD and Armstrong – asking if I might have a job working for them. I’d been reading ‘Hi Fi News’ magazine for many years. In fact it was by reading that magazine I started learning about electronics. Back in the 1960s and early 1970s Hi-Fi was a largely DIY enthusiast interest. Hi Fi News regularly published DIY articles explaining how to build an amplifier or loudspeakers. And they carried features explaining details of electronics, how transistors worked, etc. Unlike university textbooks, these were explained in simple terms, so even when at school I was able to make sense of what they contained. The Patent Office replied arranging an interview as they were looking for more Patent Examiners. Both QUAD and Armstrong replied along the lines of, “Thanks, but no thanks. No vacancy.” By that time I did have a modest Hi-Fi/Audio system which was based on an Armstrong (500 series) amplifier and tuner, and was quite impressed by them. A friend had a QUAD system which was better, but rather more expensive. Because I was keen I sent Armstrong another letter – in effect asking them to please keep me in mind if a vacancy arose because I was quite keen to work for them. The Hi-Fi bug had bitten me. West Ham colours as well as the flag! During my brief employment (perhaps not the most accurate term!) with Hawker Siddeley I’d rented a room near their factory. Having quit, I’d moved back into the Council flat I’d shared with my parents since we’d been moved out of the condemned housing in Western St in the 1960s. Since I’d only been a student up to the brief Hawker Siddeley episode we didn’t have a lot of money. So financially it helped them and me to stay together. Given the break from paid work I decided to wallpaper my bedroom to give me something useful to do. I recall quite clearly being called away from this to the phone and someone from Armstrong asking if I could come and see them. So I went to the factory that afternoon having quickly changed out of paste-spattered clothing. I was interviewed and had a discussion with them when I explained my established interest in Hi-Fi and the work I’d already done at university. They said that they’d read my initial letter but had concluded that I’d get bored if I joined them. My C.V. had proudly listed things like my trips to telescopes, developing systems to go on Concorde, being able to program mainframe computers, etc, etc. They’d assumed that this was all too ‘high powered’ for me to care much about designing a Hi-Fi amp or tuner. So by trying to impress them with my C.V. I’d actually made them decide I wasn’t the man for the job! However my second letter had made them re-think and decide it was worth seeing me. Fortunately, once talking with them I could explain my interest in audio and electronics. The outcome was that they offered me a job as a design engineer. I had to explain that I would need to consider this as I’d only just accepted a job at the Patent Office. So they gave me a day or two to think it over. But by the time I got home I knew I’d prefer working for them than for the Patent Office. It meant sacrificing a almost guaranteed permanent job with pay that rose year-by-year to impressive levels. But I was more interested in being able to design useful things and I’ve always loved music and been fascinated by Hi-Fi. So the next day I phoned Armstrong and accepted the job. I then wrote to the Patent Office, apologised, and withdrew from accepting their offer. A few days later I started work at Armstrong. It was convenient that Armstrong were in London as it allowed me to go on living in the same Council Flat as my parents. My Father was an invalid and my Mother acted as his full-time carer, so the change from being a research student to a decently-paid worker made a big difference to our income. This also allowed me to start saving up with the aim of eventually being able to buy a home of my own. However a snag was that via public transport it was an awkward journey from Forest Gate where we lived to Armstrong in Holloway. I had to take a (British Rail) train, then the Central (tube) line into Holborn, and change there to get another underground train to Caledonian Road station to get to work. In effect, travel into the center of London and out again twice a day in the rush hours. I soon learned how to wedge myself into a tube train carriage with a book up to my face so I could try and forget the crush. But it was time wasting and uncomfortable. The job was excellent, though. And the people at Armstrong were great to work with. In many ways it was like an extended family. So far as the factory itself was concerned the main irritation was that my development lab / office had almost no windows. There was just one, tiny window, low down beside my desk at the end of the room. As a result, during winter weekdays I didn’t see much sunlight. It was dark until I got to work, and dark by the time I left. The photo to the left shows me standing with my desk behind me and the test bench in front to my right. 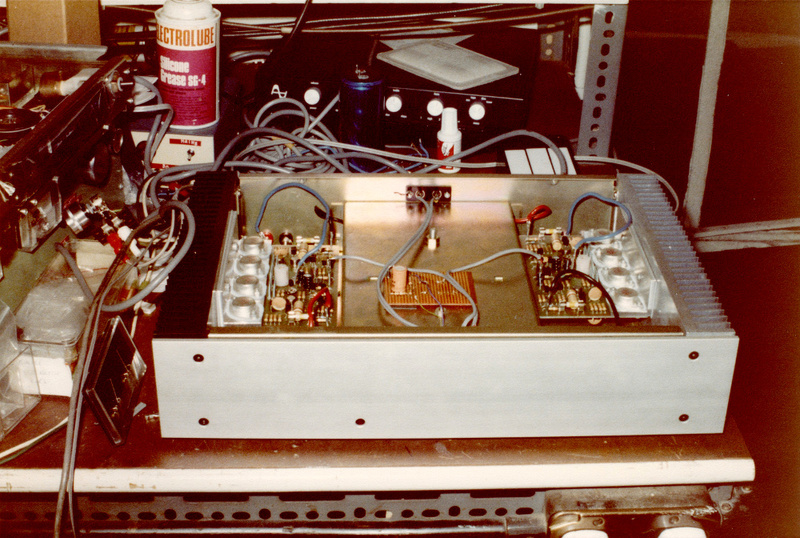 On the lab bench you can see an early prototype of the ‘700 series’ audio power amp I was developing at the time. Behind that, set quite low on the wall to the left of my desk you can see the only window the room had. Erm... I seem to have decided I had to ‘pose’ for the picture and adopted a stance which I suspect actors call ‘teapot acting’... Maybe this is what led to my appearing in pantos when I returned to QMC in later years! I’ve already written extensively about Armstrong and my time with them. So rather than duplicate all that here I can just give a reference link to the Armstrong webpages Anyone interested can have a look though them. Those pages give a detailed history of the company, its products, and the people who worked there. Here I’ll just give a few snippets that lead though my time at Armstrong to what followed next in my life. 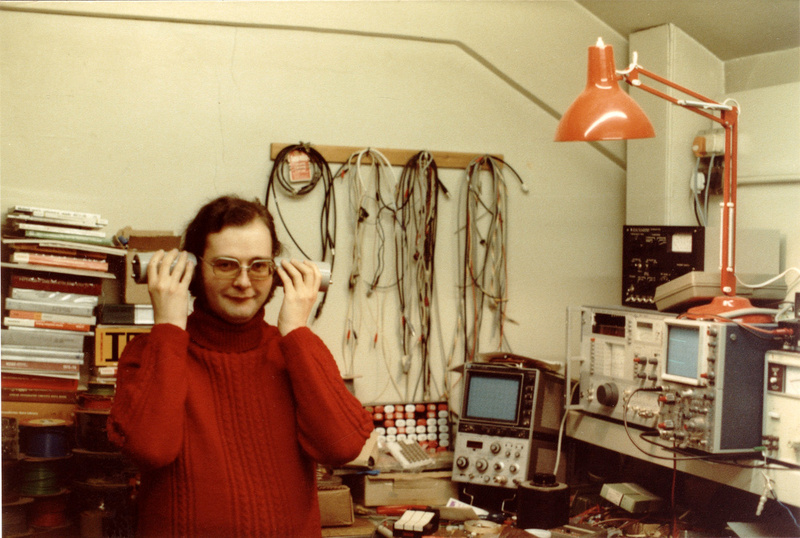 Before I’d arrived the electronic design and development work was being done by Ted Rule. Once I’d joined this changed and he focussed on developing new FM tuners whilst I was given the job of producing new amplifiers. These were to replace the then-current ‘600’ range which was selling well, but getting a bit long in the tooth. In the interim, Ted and I repeatedly upgraded and tweaked the 600 unit design to improve performance and reliability. But something totally different was required as future replacement models. On one occasion I set fire to a QUAD Electrostatic loudspeaker (ESL) when testing an amplifier. The ESL was regarded as a ‘difficult load’ which could cause some amplifier designs to burst into oscillations, fail, or, indeed, burst into flames. But it was (and still is) a truly excellent speaker that can deliver superb results. So it was vital that any new amplifier should work with the ESLs without being bothered by the load they presented. Hardly working... erm, I mean, working hard in the lab. I was trying out a particular design, wound up to high power levels to really stress the amp. Whilst doing this (playing Led Zeppelin very loud!) I was taking to someone in the doorway behind me. They suddenly said, “I can see smoke!” That caused me to look in alarm at the amplifier on the bench, searching for signs of any smoke emerging from it. As I did so, I heard “I can see flames!”. Again I looked and I couldn’t see any flames emerging from the amplifier. So I turned around to ask where... and saw a vertical column of flames emerging from the center panel of the ESL! I switched things off and the fire went out. I can testify that the Led Zep sounded much the same throughout the process! I concluded from this that the amplifier was ‘safe’ from the effects of the ESL. It was quite happy to drive audio signals into the speaker and not fail or oscillate. But alas, the speaker was then at risk of being harmed unless the user kept the sound level down for fear of setting fire to the speakers. The old ESL was often described as looking like a central heating radiator. Used with an amp that was too powerful, I’d demonstrated that it could also be made to mimic a gas fire! We sent the speaker back to QUAD to be refurbished. The result was a phone call from them asking what the (expletives deleted) we’d done to it! But they duly refurbished it OK.
One the real revelations for me during this period was to experience the stark differences between UK and Japanese industry in general during that period. When upgrading the 600 range units I quickly found that many UK-sourced components were poorer quality than Japanese equivalents. This applied to all kinds of items – switches, potentiometers, even the knobs fitted to the controls. Also, by then any UK semiconductor industry had almost vanished. In brief, I was easily able to improve the reliability and performance of the existing ‘600 range’ units by simply changing many UK components for Japanese ‘equivalents’ with almost no change in component cost. The basic problem in UK manufacturing which I saw was that many firms had failed to invest in new machinery or skills or techniques. As a result they were still making components and items by inefficient methods using machines they’d bought many decades before. That often produced results that didn’t come close to what could could be made using more modern methods. Instead, those with capital were preferring to invest it abroad. In stark contrast, the Japanese were continually improving their manufacturing and the quality of what they made. Even something as apparently simple as the knobs for rotary controls on the front of equipment was affected. I well remember getting some specimen metal knobs from a Japanese maker. These were at the same sort of price as ones made in the UK, despite being shipped half-way around the Earth. I showed them to a rep for a UK firm and his immediate response was, “You can’t make that!” What he actually meant, of course, was that his firm would be unable to match the quality of the surface finish, and had no idea how anyone could do it. They simply lacked the manufacturing equipment required. The Japanese examples had a smooth shiny satin finish. The UK ones looked scratched. The large Japanese manufacturers like Hitachi, etc, also made their own semiconductor devices. They were quite happy for us to buy them for our own sets. But they tended only to sell semiconductor devices which were – for them – ‘last years model’. i.e. This placed us in the situation of only having access to audio transistors once they had better ones to put into their own amplifiers, etc. Hence we had to try and compete on the basis of being ingenious. This suited them fine. They happily allowed us to examine their amplifiers, etc, and gave us circuit diagrams and other data. They felt secure in the knowledge that they were far, far bigger than the small UK makers like Armstrong. And could, of course, decide whenever they wanted to adopt any ideas we came up with which they liked. For me as an engineer or researcher, though, one key lesson I learned from working with Armstrong was the need to be able to deliver what was required, on time, to spec, and to cost. i.e. to end up producing a design that worked and did the job as expected. Armstrong was also a friendly place to work. The production line was at the center and everyone could see how many sets were being made, and how others were working. Despite being a line, the work was arranged in a flexible way that allowed people to take a break occasionally without disruption, and those who wished and were capable could take on extra work to earn more. Sadly, it became clear to the people financing Armstrong that they could make a higher return on their capital more effectively by leaving the Hi-Fi market. And the existing (leased) factory had to be vacated because its owners wanted to sell it off. Setting up a new one elsewhere meant finding new capital for investment. So one day I was told that the firm would eventually close, and that therefore I would lose my job there. However as I was told this by Barry Hope, one of the directors, I was also asked if I’d go on working part time to complete the ‘700’ amp I had been developing. Barry and another director (Alex Grant) hoped it might be possible to continue with it commercially despite the loss of the existing factory. I was happy to try this because I wanted to see the design completed and give people a chance to hear and buy it. That then might seed the continuation of a new Armstrong company to continue making Hi-Fi equipment. However I now needed a new day job! During my time at Armstrong I’d occasionally puzzled the secretaries who would get telephone messages for me like, “Can Wednesday be on Thursday this week?” These calls came from people I’d worked with at QMC. Despite leaving QMC I’d remained in touch with Tony Marston (technician there) and Nigel Cronin (who was now a post-doc researcher) and we used to have a drink together most weeks. Usually on Wednesday night, but sometimes shifted to another day – hence the cryptic messages. These evenings usually started via a trip for a “Pesci and chips”, named for a specific fish and chip shop in Barking. We bought fish and chips and then ate this at Tony’s home in Barking. Then ventured forth to find a pub somewhere. Often choosing one we’d never visited before just to find out what it was like. Armstrong repair and test. Note ‘Franchised Healer’ plate. At one point whilst working at Armstrong the lack of having completed a PhD and my continuing interest in physics and astronomy tempted me to try sitting in the evening classes for an MSs in astrophysics that QMC ran. However when Tony and Nigel spotted me there they led me to one of the pubs across the road from QMC and managed to apply enough drink to persuade me to drop the idea. In effect, the course was mainly for teachers who wanted a second degree for their C.V. and had an interest in astronomy. As luck would have it, just a few days before I was told the Armstrong factory was to close I’d read an interesting advert in ‘New Scientist’ magazine. This was inviting applications for a post-doctoral position to work on millimetre-wave instrumentation in Professor Derek Martin’s group. As soon as I left the office where I’d been told the factory was to close I went back to my lab and searched for that copy of New Scientist. The obvious snag was that it specified the position was ‘post doctoral’. i.e. the person appointed should have a PhD. However I had worked in the area of expertise, and was a known quantity to the people involved. So I phoned Nigel and asked him if he thought that Derek Martin might consider me for the job. He said he’d find out and get back to me. Then phoned back a short time later and said, ‘yes’. So I went back to QMC and had an interview with Derek. He was happy to give me the job, regardless of it nominally requiring a PhD. What he had known of my work in the past was enough. I was delighted to accept, but asked if I could also use the work as a basis for a PhD with him as my supervisor. He agreed. He did say that this was provided he didn’t have to do much beyond the formal requirements. That was fine with me. And in reality he actually was very helpful, despite his warning. In fact I should say that I soon discovered that Derek Martin was not only the best physicist I’ve ever worked with, he is also a really decent, considerate, and helpful person. The term ‘gentleman’ isn’t used much these days. But if ever the term applied to anyone I’ve known, it fits him like a glove. And without him, my later career would never have happened. So within the space of a week or two I went from being a full-time development engineer at Armstrong to working back at QMC for Derek Martin in his Engineering Physics group. Throughout my life I’ve never actually had any kind of ‘life plan’ in mind. In practice what seems to have happened is that I’ve been lucky. As one door closed another would open. I would then do something which presented itself and was interesting. I was born into a poor area in housing that would have been called ‘slum’. But I lived at a time when Councils were building many Council homes to be rented at low cost. And Governments were willing not only to increase the numbers of University and College places, but to provide free access and decent grants. Because of that I was the first person in my family to go to University. I don’t think this was because I was smarter than anyone else in the family, but simply because I was amongst the first generation when this became possible. Similarly, despite the image of the 1970s painted since by the tabloids of it being an awful time, it was in those days relatively easy to find a decent job. Again, in that I was lucky. Derek had actually offered me a PhD studentship under his supervision back when I finished my first degree. At that time he was Head of the Physics Dept. at QMC and thought it would suit me. However I didn’t know him as well, then, as I came to later on. And I was very interested in astronomy, so thought the QMC Astro group was the place to go for me. If I’d accepted his offer I might have got a PhD at that point and stayed on at QMC, never going to work for Armstrong. But in the end things turned out fine, and my time at Armstrong helped me later on. Prototype 700 power amp in lab. Final version was distinctly different. In a sense, during the 1978-81 period I had three jobs. My main job was developing equipment for the United Kingdom Infra-Red Telescope (UKIRT) on Hawai’i. In addition I was collecting notes on what I was doing and using it to build a PhD thesis. 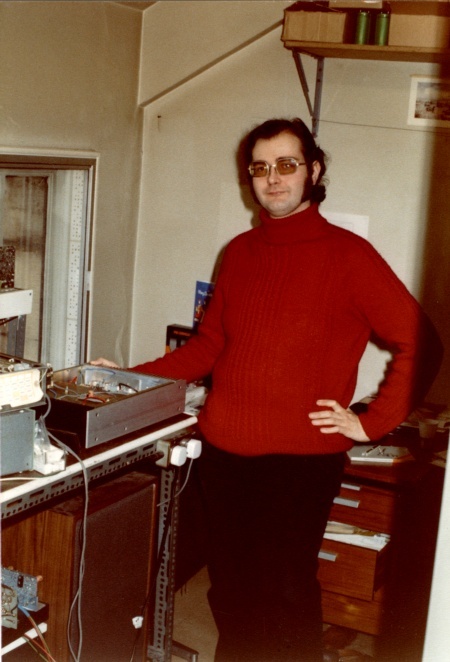 And each weekend I went down to East Grinstead to work for Armstrong, moving forward the development of the 700 series amplifiers. The Armstrong work wasn’t paid. The plan was that if the results were a success I could then be paid or employed by the resulting company. 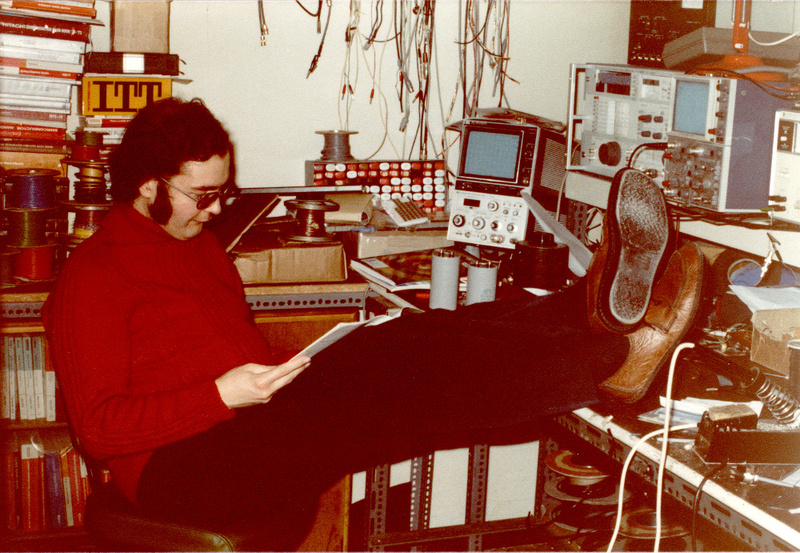 Barry Hope had set up a development lab in his back bedroom. His own knowledge of electronics at that point was pretty basic. But each weekend I arrived and started working on the amplifiers on Friday evening. This continued to Sunday, and I then took a train back to the flat in Forest Gate on Sunday night. I then got up and went to QMC on Monday morning. During the week Barry would work doing tests, etc, we’d discussed, learning as we went along. He’d send me letters and we’d exchange phone calls to help things forward. Thank heavens I was young and lively enough to cope at the time! Sadly, the amplifier didn’t survive, and Armstrong ceased designing and making Hi-Fi equipment. I regret the ending of Armstrong as a manufacturer. The people there deserved to succeed, but events were stacked up against them. However as a result of Derek being willing to give me the job at QMC my later career was back in Far-Infrared / millimetre-wave instrumentation... And finally I got my PhD in 1981. From then on it was a life on the millimetre-wave! My thanks to a good friend, John Scott, for the photos of me in the Armstrong lab.